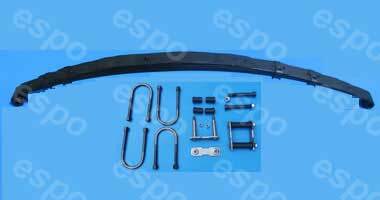 We sell both front end kits and individual parts. Bushings are available in rubber or poly. Most car shackle kits usually include bushings, bolts, nuts and sideplates. Truck shackles vary. Bushings are available in rubber and poly. 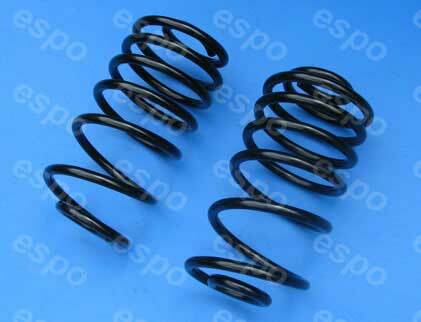 Springs are sold in matched pairs and include the pressed in bushings if applicable. We sell stock height and 1 or 2 inch lift or lowering springs. Coils are sold in matched pairs. Standard and heavy duty available. Live Chat! Available during business hours. Call 800-903-9019 for pricing for your vehicle! 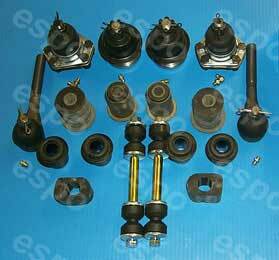 Ball joints, tie rod ends, control arm bushings, idler arm, pitman arm etc. Coil springs available for most vehicles! Matched pairs, pressed in bushings included! Shackles, u-bolts, eye bolts and pads available! LiveChat - Get prices via a computer chat! It's quick and you don't have to worry about lost emails and you get exact prices for your vehicle. We can even give you a link to securely pay for your parts so all can be done online. Most of the parts we sell are stocked and shipped directly from our warehouse. Our specialty is American cars, light trucks and SUVs in the 1950's through 1990's, but we sell suspension parts for most makes, models and years. Some of the automotive suspension parts we sell are standard & heavy duty leaf springs and coil springs, lift springs, lowering springs, shackle kits, u-bolts, rubber bushings, polyurethane bushings, individual front end parts and front end rebuild kits. Parts are available for most makes, models, years, body styles, engine sizes, etc. We do not currently sell shocks, struts, sway bars or torsion bars. Contact us today, we'd love to discuss your suspension needs! Copyright 2013. ESPO Springs n Things, Inc. All Rights Reserved.